Having a server at home is a great luxury, but having a computer running 24×7 is an extreme waste of energy. Turning it on and off manually is not very appealing, either. Luckily we have to do neither. Windows can easily be configured to put the computer into sleep mode (where modern PCs consume approx. 1 Watt) and have it wake up upon access. This is the easy part. We do not have to do anything; the default power plan instructs Windows to go to sleep after 20 minutes of inactivity. Getting Windows to wake up on demand sounds like a difficult thing. Those of you that know Wake-on-LAN may think of magic packets and networking tools. Those are certainly necessary in enterprise environments, but in the typical home network the situation is much simpler. Since there are only a handful of devices on the network and those do not talk to the server constantly we can simple instruct the server to wake up whenever anyone talks to it. This works on Windows 7. Windows 8 is a bit special: Wake-On-LAN is only supported from sleep or hibernate, not from hybrid or classic shutdown. This is because, as KB2776718 states, “users expect zero power consumption and battery drain in the shutdown state”. Reply from 192.168.0.24: Destination host unreachable. As you can see, only two pings are lost! But wait, you may say, if my home server sleeps most of the time, with its RAM buffered by electrical power, what happens during a power outage? The machine would be reset brutally. That would be true if Windows did not use “Hybrid Sleep” by default, which is a combination of Sleep and Hibernate. The current state is buffered in RAM, but it is also written to disk. After a power outage, the system’s state is simply read from disk instead of RAM. thanks a lot for your post! I need exactly what you are describing, but it does not work. I have a server which should go to sleep after 20/30 minutes. Once a client tries to access one of its shared folders, it should wake up. My configuration is like yours (which is the default btw.). But my server does not wake up. Forgot to say: I am using Windows 8 Professional. Hi, I tried your method but ping still can’t wake up my win 8.1 pc. Do you need setup on router by any means? Thanks for this informative article. I had some troubles with Win 10. 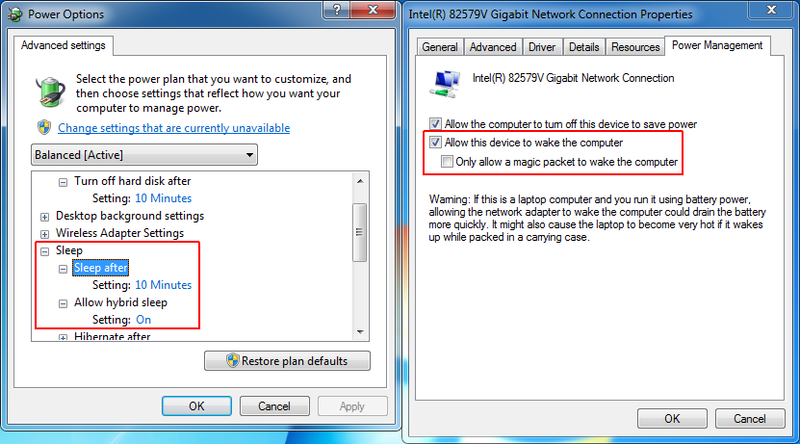 For example, after I upgraded it from win 8, my Wake-on-LAN does not work. I tried many things and finally I solved the problem. Here you can find how to configure Wake-on-LAN on Windows 10. Hope it helps for somebody else who read this article. Well this just doesn’t work. Curious to know how you pinged a hostname and got an IP address from a machine that was turned off… Some local DNS server running on your network? If the server is just in sleep mode the network connection is still maintained somewhat from my understanding. got a Windows Server 2012. it wakes up on LAN, when I start running my windows 7 Computer. If I start my Windows 7 on my MacBook, the server doesn’t wake up. It will wake up by sending a package from my MacBook or iPad or Smartphone. Can anybody help?